Harold Lloyd's last silent film comedy — Speedy (1928) — is the feature film on the KSO's Season opener. Providing live film score accompaniments, over the years, to both silents and talkies, offers KSO audiences a visually and historically enhanced concert experience. Live musical accompaniment to films creates a unique audio/visual genre, allowing both musicians and audience to see, hear, experience and appreciate the indelible impact and role music plays in our cinematic viewing. — James Cassidy, KSO Music Director. 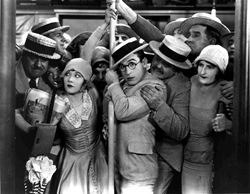 The Kentucky Symphony Orchestra opens its 23rd season accompanying the 1928 Harold Lloyd silent film comedy "Speedy", a film that takes the camera and audience on a live action tour of New York City including Coney Island and featuring various modes of public transportation — taxi, streetcar and a horse-drawn trolley. "Speedy" will be accompanied by a live performance of a jazzy 1920’s inspired score written in 1992 by award winning film and television composer Carl Davis. Over the years the KSO has performed several of Mr. Davis’s silent film scores including the epic Ben-Hur, Safety Last and The Freshman. The KSO has also accompanied “talkies’ including Wizard of Oz, and Pirates of the Caribbean. "Live musical accompaniment to films creates a unique audio/visual genre, allowing both musicians and audience to see, hear, experience and appreciate the indelible impact and role music plays in our cinematic viewing." stated KSO Music Director James Cassidy. In the 87 minute film, "Speedy", Lloyd portrays a baseball crazy young man who can’t hold down a job, but in the end save’s New York’s last equine-powered streetcar. The NYC locations and views are truly historic, and Babe Ruth makes an extended cameo appearance as Harold’s passenger in a wild taxi ride to Yankee Stadium. Speedy was the last silent film to feature the antics of Harold Lloyd. — baseball season is winding down. Step back to 1928 and join Harold Lloyd and members of the Kentucky Symphony Orchestra under the direction of James Cassidy, for its season opener and a rare chance to see this classic film accompanied live by a theater orchestra — 8:00 p.m., Saturday, October 11 at Florence Baptist Church at Mt. Zion. Tickets are $19, $27, $35 (children 6-18 are 50% off) and are available online, by phone or at the door. http://www.kyso.org / (859) 431-6216. About the KSO: The Kentucky Symphony Orchestra takes the “phony” out of symphony through thematic concerts that culturally enrich, educate and entertain the residents of Northern Kentucky and Greater Cincinnati. The KSO performs throughout Northern Kentucky performing three series of concerts, for the schools, in the parks and at various indoor venues.